At the northern part of the sky you can find the "Triangle". It is a relatively inconspicuous constellation of only three stars and of these only one reaches a size class 3. 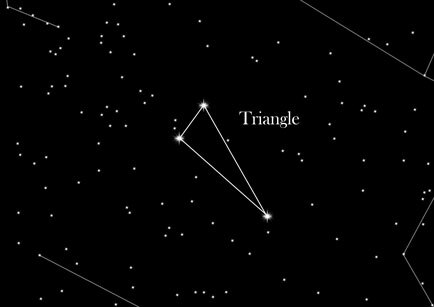 In the southern hemisphere there is a matching counterpart to the "triangle" called the "Southern Triangle" or "Triangulum Australis". The northern "Triangle" is one of those constellations of the ancient world, which has already been mentioned Ptolemy. About 10 ° north from the head of the constellation "Aries" you will find the Northern Triangle. The most conspicuous object in the constellation Triangulum is the spiral galaxy M33. The open star clusters NGC 752 is beautiful to watch. The constellation provides a slightly elongated isosceles and the Triangle represents the brightest of the three stars there. Its neighboring constellations are Andromeda, the Fish, the Ram and the Perseus. The Greeks called the "Triangle" also "Trigonon", "Delta", or "Deltoton". Among others they saw the Nile Delta in it. But the Triangle also stands for Sizily, an island in the Mediterenean Sea, which is consecrated to Demeter. It’s said that Persephone was kidnapped from there into the Hades, the underworld. Hades, also the name of the god of the underworld, fell in love with Kore. He asked his brother Zeus, the godfather, to marry her. Zeus neither agreed nor declined the request, because he knew that Kore wouldn’t want to move into the dark underworld. So Hades kidnapped Kore and brought her to the underworld against her will, where she was named Persephone from there on.